Its white railings and posts are unmistakable. Its two-tiered street sign is practically a local landmark. 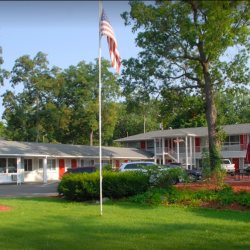 For over 60 years, Grand Traverse Motel has seen the small town of Traverse City literally grow up around it. In that time, the motel has offered clean, convenient, and affordable comfort to countless guests. 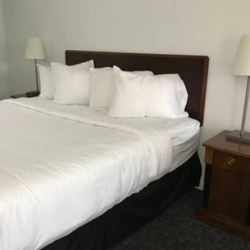 Located on Munson Avenue in the heart of the city, this 18-room motel offers walkable convenience to downtown and drivable accessibility to nearly every area attraction. 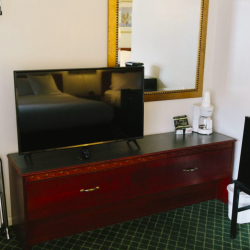 Grand Traverse Motel welcomes a variety of guests with an even greater variety of interests. “We get people from all over,” Allie exclaims. “Australia, Germany, Japan…our area has really become an international draw. We get guests who want to bike the TART Trail, take a winery tour, hike Sleeping Bear Dunes…you name it. They simply want a clean, comfortable room they can return to at the end of the day. That’s what we provide.” For Grand Traverse Motel, it’s a tradition of hospitality that’s over 60 years and counting.